EnGarde is excited to announce its T-SHIRT™ style carrier system. The most stylish and concealable vest this armor manufacturer has ever produced. Clients asked EnGarde for a carrier system that provided maximum concealment for undercover operations. The popular DELUXE™ model already set the standard for concealable armor. But customers wanted an even slimmer carrier system that could be worn without any type of undergarment. 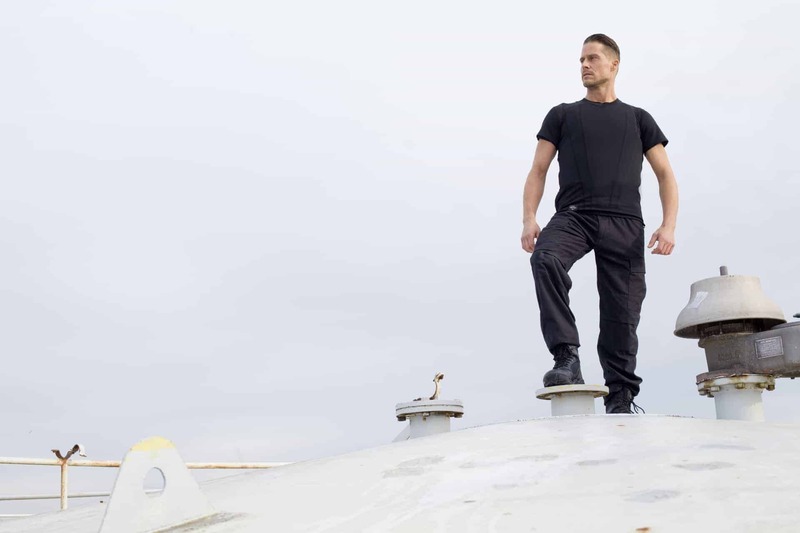 “The goal was to develop a carrier that really looks and feels like a T-shirt, while providing the same high level of ballistic protection as our other body armor products,” says Iwan Luiten, Marketing Manager at EnGarde. While most of EnGarde’s clients are military or law enforcement agencies, the T-SHIRT™ has drawn a lot of interest from the civilian market as well. Private security especially appreciates the more casual profile. While the T-SHIRT™ body armor carrier may be compatible with all EnGarde’s ballistic panels, the FLEX-PRO™ panel is recommended as the most ideal pairing. That soft armor combination weighs just 1.85 kg (4 lbs) while still providing NIJ Level IIIA threat protection. The knitted Coolmax® Fresh fabric of the T-SHIRT™ body armor not only keeps the armor snug against the torso, it keeps the wearer cool and dry with advanced moisture wicking capability. 2018 has been an exciting year for EnGarde. Two concealable carrier systems have already been launched and later this year two modular tactical carriers will be rolled out. These will replace the current Leopard™ and Panther™ models. EnGarde is an ISO 9001 certified body armor manufacturer based in the Netherlands. With an international network of distributors in more than 30 countries, EnGarde is able to advise and serve customers worldwide. The company offers high-quality body armor solutions as well as lightweight hard armor plates, helmets, and bomb blankets.